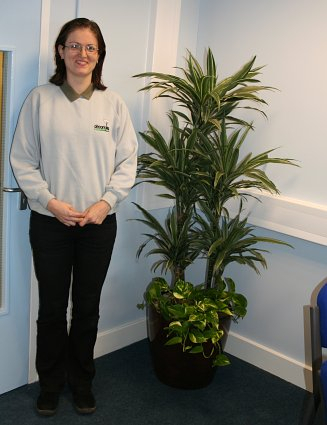 Time to introduce a new member of staff - most of you have probably now met Katalin. Kate, as she prefers to be called, joined us in July 2006. She has an obvious love of plants and a very keen sense of humour, so we think that she fits into our little team very well indeed. Kate is Hungarian and following a period improving her English as an au-pair in Bournemouth in 2003 came back to England in 2005 to gain permanent residency. As her university degree specialised in English technical translation it hasn't taken her long to learn the Latin names of plants, usually the most difficult aspect of our job! On a recent holiday back home to see her family, she returned to the office laden with paprika of various strengths and plenty of advice on best usage! When you see the quality of her work, we are sure that you will agree she has been a very good "find" indeed, and we all look forward to a long working relationship and good friendship.